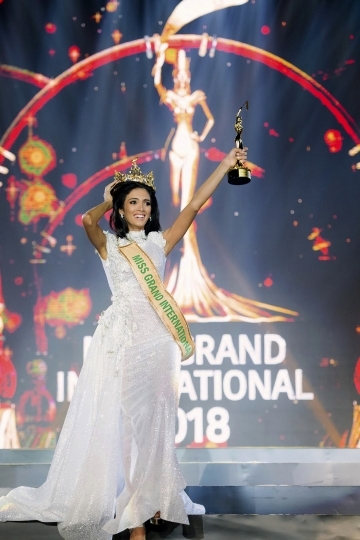 BANGKOK — A Paraguayan beauty pageant winner swooned on stage after admitting the anticipation just before the announcement was unbearable. Sosa soon recovered and waved, cried and smiled to cameras before she was surrounded by fellow contestants who congratulated her. In an interview before the winner was announced, Sosa said breathlessly that she might need a doctor because she felt like she would have a heart attack. The international beauty pageant's finals were held Thursday in Yangon, Myanmar. Earlier in the night, contestants were asked which country they would visit to campaign for an end to wars and violence. Sosa said if she won she would "strategically" choose to visit President Donald Trump "because the United States is an example for other countries. So my first message to him would be: please be an example of peace, love and tolerance."